The Dutch Revolt (1568–1648) [note 1] was the revolt of the northern, largely Protestant Seven Provinces of the Low Countries against the rule of the Roman Catholic Habsburg King Philip II of Spain, hereditary ruler of the provinces. The northern provinces (Netherlands) eventually separated from the southern provinces (present-day Belgium and Luxembourg), which continued under Habsburg Spain until 1714. In a series of marriages and conquests, a succession of Dukes of Burgundy expanded their original territory by adding to it a series of fiefdoms, including the Seventeen Provinces. Although Burgundy itself had been lost to France in 1477, the Burgundian Netherlands were still intact when Charles V was born in Ghent in 1500. He was raised in the Netherlands and spoke fluent Dutch, French, Spanish, and some German. In 1506, he became lord of the Burgundian states, among which were the Netherlands. Subsequently, in 1516, he inherited several titles, including that of King of Spain, which had become a worldwide empire with the Spanish colonization of the Americas. In 1519, Charles became ruler of the Habsburg empire, and he gained the title Holy Roman Emperor in 1530. Although Friesland and Guelders offered prolonged resistance (under Grutte Pier and Charles of Egmond, respectively), virtually all of the Netherlands had been incorporated into the Habsburg domains by the early 1540s. Flanders had long been a very wealthy region, coveted by French kings. The other regions of the Netherlands had also grown wealthy and entrepreneurial. Charles V's empire had become a worldwide empire with large American and European territories. The latter were, however, distributed throughout Europe. Control and defense of these were hampered by the disparity of the territories and huge length of the empire's borders. This large realm was almost continuously at war with its neighbors in its European heartlands, most notably against France in the Italian Wars and against the Ottoman Empire in the Mediterranean Sea. Further wars were fought against Protestant princes in Germany. The Dutch paid heavy taxes to fund these wars,  but perceived them as unnecessary and sometimes downright harmful, because they were directed against their most important trading partners. In 1556 Charles passed on his throne to his son Philip II of Spain. Charles, despite his harsh actions, had been seen as a ruler empathetic to the needs of the Netherlands. Philip, on the other hand, was raised in Spain and spoke neither Dutch nor French. During Philip's reign, tensions flared in the Netherlands over heavy taxation, suppression of Protestantism, and centralization efforts. The growing conflict would reach a boiling point and lead ultimately to the war of independence. Alba took harsh measures and rapidly established a special court (Raad van Beroerten or Council of Troubles) to judge anyone who opposed the King. Alba considered himself the direct representative of Philip in the Netherlands and frequently bypassed Margaret of Parma, the king's half-sister who had been appointed governor of the Netherlands, and made use of her to lure back some of the fugitive nobles, notably the counts of Egmont and Horne, causing her to resign office in September 1567. Egmont and Horne were arrested for high treason, condemned, and a year later beheaded on the Grand Place in Brussels. Egmont and Horne had been Catholic nobles, loyal to the King of Spain until their deaths. The reason for their execution was that Alba considered they had been treasonous to the king in their tolerance to Protestantism. Their executions, ordered by a Spanish noble, provoked outrage. More than one thousand people were executed in the following months. The large number of executions led the court to be nicknamed the "Blood Court" in the Netherlands, and Alba to be called the "Iron Duke". Rather than pacifying the Netherlands, these measures helped to fuel the unrest. William I of Orange was stadtholder of the provinces Holland, Zeeland and Utrecht, and Burgrave of Antwerp, and he was the most influential noble in the States General who had signed the petition. After the arrival of Alba, to avoid arrest as had happened to Egmont and Horne, he fled to the lands ruled by his wife's father — the Count- Elector of Saxony. All his lands and titles in the Netherlands were forfeited to the Spanish King. Crescent-shaped Geuzen medal, cast silver, tooled, about 1570, with the slogan " Liever Turks dan Paaps" ("Rather Turkish than Papist"). Even so, by 1570 the Spanish had more or less suppressed the rebellion throughout the Netherlands. However, in March 1569, in an effort to finance his troops, Alba had proposed to the States that new taxes be introduced, among them the "Tenth Penny", a 1/10 levy on all sales other than landed property. This proposal was rejected by the States, and a compromise was subsequently agreed upon. Then, in 1571, Alba decided to press forward with the collection of the Tenth Penny regardless of the States' opposition. This aroused strong protest from both Catholics and Protestants, and support for the rebels grew once more and was fanned by a large group of refugees who had fled the country during Alba's rule. Most of the important cities in the provinces of Holland and Zeeland declared loyalty to the rebels. Notable exceptions were Amsterdam and Middelburg, which remained loyal to the Catholic cause until 1578. William of Orange was put at the head of the revolt. He was recognized as Governor-General and Stadholder of Holland, Zeeland, Friesland and Utrecht at a meeting in Dordrecht in July 1572. It was agreed that power would be shared between Orange and the States. With the influence of the rebels rapidly growing in the northern provinces, the war entered a second and more decisive phase. On 6 January 1579, prompted by the new Spanish governor Farnese, and upset by aggressive Calvinism, some of the Southern States ( County of Artois, County of Hainaut and the so-called Walloon Flanders located in what is now France and Wallonia) left the alliance agreed upon by the pacification of Ghent and signed the Union of Arras (Atrecht), expressing their loyalty to the Spanish king. This meant an early end to the goal of united independence for the seventeen provinces on the basis of religious tolerance, agreed upon only three years previously. William of Orange, who had been declared an outlaw by Philip II in March 1580,  was assassinated by a supporter of the King on 10 July 1584. He would be succeeded as leader of the rebellion by his son Maurice of Nassau, Prince of Orange. While England had unofficially been supporting the Dutch for years, Elizabeth had not officially supported the Dutch because she was afraid it might aggravate Spain into a war. However, the year before, the French Catholic League had signed a treaty with Spain to destroy the French Protestants. Afraid that France would fall under control of the Habsburgs, Elizabeth now decided to act. In 1585, under the Treaty of Nonsuch, Elizabeth I sent the Earl of Leicester to take the rule as lord-regent, with 5,000 to 6,000 troops, including 1,000 cavalry. 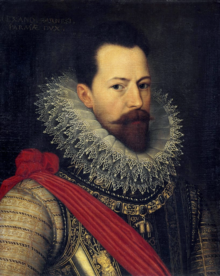 The Earl of Leicester proved to be a poor commander, and also did not understand the sensitive trade arrangements between the Dutch regents and the Spanish. Moreover, Leicester sided with the radical Calvinists, earning him the distrust of the Catholics and moderates. Leicester also collided with many Dutch patricians when he tried to strengthen his own power at the cost of the Provincial States. Within a year of his arrival, he had lost his public support. Leicester returned to England, after which the States-General, being unable to find any other suitable regent, appointed Maurice of Orange (William's son), at the age of 20, to the position of Captain General of the Dutch army in 1587. On 7 September 1589 Philip II ordered Parma to move all available forces south to prevent Henry of Navarre from becoming King of France. For Spain, the Netherlands had become a side show in comparison to the French Wars of Religion. 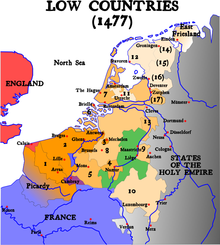 The borders of the present-day Netherlands were largely defined by the campaigns of Maurice of Orange. 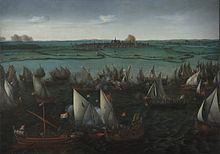 The Dutch successes owed not only to his tactical skill but also to the financial burden Spain incurred replacing ships lost in the disastrous campaign of the Spanish Armada in 1588, and the need to refit its navy to recover control of the sea after the subsequent English counterattack. One of the most notable features of this war are the number of mutinies by the troops in the Spanish army because of arrears of pay. At least 40 mutinies in the period 1570 to 1607 are known. In 1595, when Henry IV of France declared war against Spain, the Spanish government declared bankruptcy again. However, by regaining control of the sea, Spain was able to greatly increase its supply of gold and silver from the Americas, which allowed it to increase military pressure on England and France. Under financial and military pressure, in 1598, Philip ceded the thrones of the Netherlands to his elder daughter Isabella and her husband (Philip's nephew) Albert following the conclusion of the Treaty of Vervins with France. They proved to be highly competent rulers. By that time Maurice was engaged in conquering important cities in the Netherlands. Starting with the important fortification of Bergen op Zoom (1588), Maurice conquered Breda (1590), Zutphen, Deventer, Delfzijl and Nijmegen (1591), Steenwijk, Coevorden (1592) Geertruidenberg (1593) Groningen (1594) Grol, Enschede, Ootmarsum, Oldenzaal (1597), Rheinberg (1601) and Grave (1602). 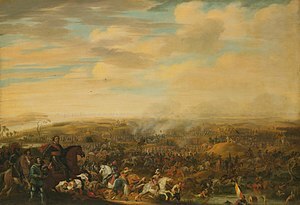 As this campaign was restricted to the border areas of the current Netherlands, the heartland of Holland remained at peace, during which time it moved into its Golden age. Although the States-General army won great acclaim for itself and its commander by inflicting a then-surprising defeat of a Spanish army in open battle, Maurice halted the march on Dunkirk and returned to the Northern Provinces. Maurice never forgave the regents, led by van Oldenbarneveld, for being sent on this mission. [ citation needed] By now the division of the Netherlands into separate states had become almost inevitable. With the failure to eliminate the Dunkirk threat to trade, the states decided to build up their navy to protect sea trade, which had greatly increased through the creation of the Dutch East Indies Company in 1602. The strengthened Dutch fleets would prove to be a formidable force, hampering Spain's naval ambitions thereafter. As more European countries began to build their empires, the war between the countries extended to colonies as well. Battles for profitable colonies were fought as far away as Macau, East Indies, Ceylon, Formosa ( Taiwan), the Philippines, Brazil, and others. The most important of these conflicts would become known as the Dutch-Portuguese War. The Dutch carved out a trading empire all over the world, using their dominance at sea to great advantage. The Dutch East India Company was founded to administer all Dutch trade with the East, while the Dutch West India Company did the same for the West. On 30 January 1648, the war ended with the Treaty of Münster between Spain and the Netherlands. In Münster on 15 May 1648, the parties exchanged ratified copies of the treaty. This treaty was part of the European-scale Peace of Westphalia that also ended the Thirty Years' War. In the treaty, the power balance in Western Europe was readjusted to the actual geopolitical reality. This meant that de jure the Dutch Republic was recognized as an independent state, and that the long-existing separation of the Netherlands (and also the Old Swiss Confederacy) from the Holy Roman Empire was finally recognized. The Republic retained control over the territories that were conquered in the later stages of the war. The now officially recognized republic still consisted of the seven provinces that in 1579 concluded the Union of Utrecht: Holland, Zeeland, Utrecht, Gelderland, Overijssel, Friesland, and Groningen. Each province was governed by its sovereign States, such as the States of Holland and West Friesland and States of Friesland, assisted by a stadtholder and by an executive council, variously called Gecommitteerde Raden or Gedeputeerde Staten (Delegated States). Each stadtholder was appointed by the States of the province and also subordinate to the States-General. However, the princes of Orange-Nassau, beginning with William I of Orange, became de facto hereditary stadtholders in Holland and Zeeland. In practice they usually became stadtholder of the other provinces as well (except for Friesland, where the cadet branch of Nassau-Dietz provided the stadtholders). A constant power struggle, which already had shown its precursor during the Twelve Years' Truce, emerged between the Orangists, who supported the stadtholders, and the Dutch States Party supporters. As the revolt and its suppression centered largely around issues of religious freedom and taxation, the conflict necessarily involved not only soldiers, but also civilians at all levels of society. This may be one reason for the resolve and subsequent successes of the Dutch rebels in defending cities. [ citation needed] Another factor was that the unpopularity of the Spanish army, which existed even before the start of the revolt,  was exacerbated when in the early stage of the war a few cities were purposely sacked by the Spanish troops after having surrendered; this was done as a practice to intimidate the remaining rebel cities into surrender. Given the involvement of all sectors of Dutch society in the conflict, a more-or-less organized, irregular army emerged alongside the regular forces. [ citation needed] Among these were the geuzen (from the French word "gueux" meaning "beggars"), who waged a guerrilla war against Spanish interests. Especially at sea, the 'watergeuzen' were effective agents of the Dutch cause. In the later stages, Maurice raised a professional standing army that was even paid when no hostilities were taking place, a radical innovation in that time and part of the Military Revolution. This ensured him of loyal soldiers, who were trained in co-operating among each other and were intimately familiar with the doctrines of their commanders and were capable of carrying out complicated manoeuvres. Politically, a unique situation had emerged in the Netherlands where a republican body (the States General) ruled, but where a (increasingly hereditary) noble function of Stadtholder was occupied by the house of Orange-Nassau. This division of power prevented large scale fighting between nobility and civilians as happened in the English Civil War. [ citation needed] The frictions between the civil and noble fractions, that already started in the twelve years' truce, were numerous and would finally lead to an outburst with the French supported Batavian Republic, where Dutch bourgeoisie hoped to get rid of the increasing self-esteem in the nobility once and for all. [ citation needed] However, in a dramatic resurgence of nobility after the Napoleonic era the republic would be abandoned in favour of the foundation of the United Kingdom of the Netherlands. Thus, one of the oldest republics of Europe was turned into a monarchy, which it still is today. ^ Osiander, Andreas (Spring 2001). "Sovereignty, International Relations, and the Westphalian Myth". International Organization. 55 (2): 251–287. doi: 10.1162/00208180151140577.